Be right in the action, steps from 5th Avenue in the heart of Playa Del Carmen. This is an opportunity you cannot miss: A 1,000 sq. ft., 2-bedroom, 2-bath condominium on Calle 26 between 5th and 1st Avenue. This condo for sale in Playa del Carmen is located in a premier building with 10 bespoke apartments that share a stunning rooftop deck and pool. The building also has underground parking and an elevator. The apartment rents very well and is offered fully furnished (minus the art). The Living Room and Private Terrace include high-end furnishings; custom dining table for 8, entertainment center, and one of kind banyan tree coffee table. Also included are a 50 inch Sony HDTV and stereo. The stunning rooftop includes a tiled pool, lounging area, day beds, dining table and offers unparalleled views of the sea and city. The kitchen has stone counter tops with high-end appliances made by GE profile and Bosch. It has everything you need for cooking including a stove, microwave, refrigerator, coffeemaker, cutlery, glasses, dishes, pots, and pans. The master bedroom has a custom made queen size bed and a large closet well equipped with shelves, drawers, hanging space and safe. The second bedroom has a clever bunk and trundle bed arrangement that fits 4 people supporting an occupancy of 6 people in total. It also offers a large custom closet with a sizeable owner’s lock-off and its own bathroom. 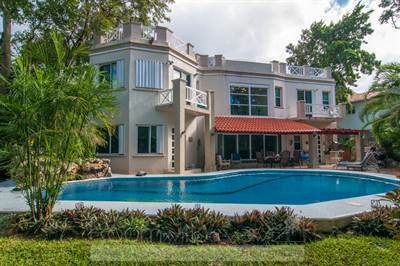 Luxurious and spacious home for sale in Playa del Carmen's famous Playacar gated community. Nested between the prestigious Playacar golf course and the turquoise waters of the Caribbean Sea, this wonderful 4-bedroom luxury residence for sale in Playa del Carmen seems almost like a dream-home. Located inside Playacar, one of the most exclusive areas in Playa this home for sale is both downtown and extremely close to the beach. Playacar is a tranquil gated community with controlled access, where owners have privileged access to beach clubs and the 18-hole golf course. 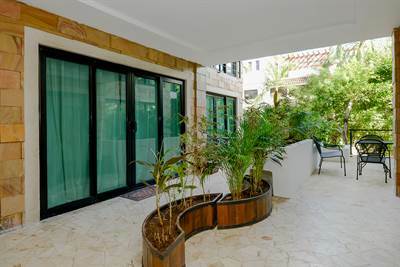 This home for sale in Playa del Carmen was designed by the current owners as their main residence, and therefore it features details that you will not find on any other home, such as the reverse osmosis water purifier, and its own power transformer which provides the house with power at approximately 50% of the market value. Beautiful touches and luxury details are everywhere around this magnificent home: The driveway is extra-wide and there is a 2-car garage. Marble tile floors, an intelligent layout and clever use of outdoor spaces truly set this home apart from the rest of the properties for sale in this area. The master bedroom has a grand master bathroom complete with a full sized American style bath tub, and each one of the bedrooms features an en-suite bathroom. Enjoy a run on the beach in the morning, play some golf in the afternoon, and host an evening bbq with family and friends overlooking the golf course and the beautiful private pool in the garden. Are you ready to enjoy the lifestyle that comes with this home? Downtown condo – Already popular for vacation rentals! 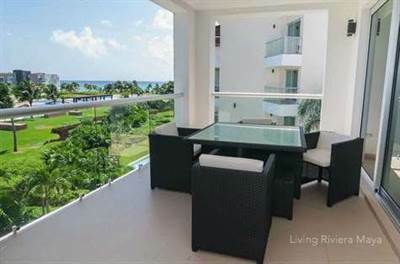 2-Bedroom penthouse for sale in Playa del Carmen. Located at Avenida 20 and Calle 20, a couple of blocks from the famous 5th Ave, one block from the Mega, Las Gaviotas II condominium is quiet and very well located with parking for 1 car, a large pool, palapa area, and baby pool. This is one of the most sought-after buildings in Downtown Playa! This Penthouse for sale in Playa del Carmen features 2 bedrooms / 2.5 bathrooms, laundry room, terrace, large Jacuzzi on a private rooftop, private parking for 1 car, and AC mini split in each bedroom and living room. 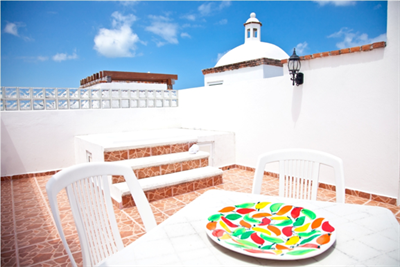 It is offered fully-furnished and equipped, ready for vacation rentals. The property is deeded and ready for sale. This property has some vacation rentals booked, which may be transferred to the new owner or relocated. 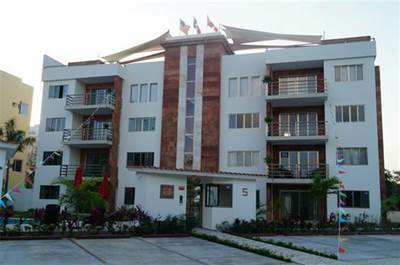 This is a rare opportunity to own an already popular vacation rental condo in Playa del Carmen! Call us now for more information or to schedule a booking. Located right on 5th avenue! These condos won't be on the market for long! 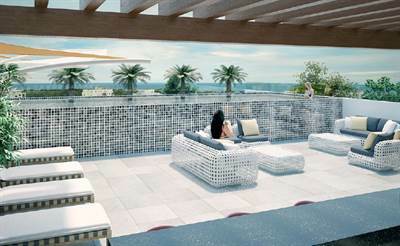 Exclusive condos for sale in Playa del Carmen, right on 5th Avenue! These 16 exclusive condos for sale on Playa del Carmen's 5th Ave. feature large terraces and a rooftop lounge area with a pool and views of the Caribbean Sea,. On World-famous 5th Avenue you will find more than 800 food varieties, World-class hotels, malls, art galleries and more! Also, these condos are only 3 blocks away from the beach, making them ideal for vacation rentals. These beautiful and modern-styled condos are sold fully-equipped, so you don't need to worry about anything! There is an elevator on all floors, 24-hour security, a lobby, and 2 different models to choose from. Don't waste this opportunity to own property on 5th Avenue! These will go fast! Located on 5th Avenue! These condos won't be on the market for long! These 16 exclusive condos for sale on Playa del Carmen's 5th Ave. feature large terraces and a rooftop lounge area with a pool and views of the Caribbean Sea. Gorgeous condo with luxury amenities! Excellent price for this location! Beautiful luxury condo for sale in Puerto Aventuras, Riviera Maya. This condo for sale in Puerto Aventuras features a 2-level layout, 2 bedrooms, 2 bathrooms, living room, dining room, fully-equipped kitchen, utility room and more, and is sold fully furnished. 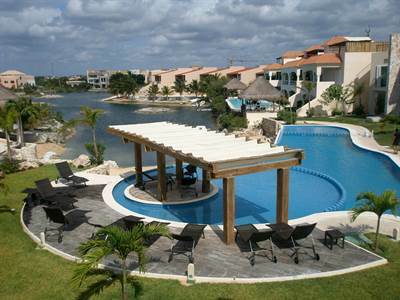 Enjoy the beauty of the Puerto Aventuras lagoon from your own private solarium with jacuzzi! This condo for sale in Puerto Aventuras is located a very short drive away from Playa del Carmen's downtown area, 5th avenue restaurants, shops and malls, and about one hour away from the Cancun airport. Don't miss this chance to own a luxury condo in Puerto Aventuras at this amazing price! 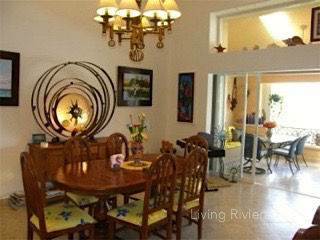 Call us today to schedule a showing or for more details on this condo for sale in Puerto Aventuras. 308 El Taj beachside in Downtown Beachfront, Playa del Carmen is Sold!